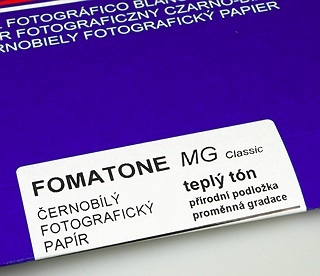 Fomatone 131 is a variable contrast, black and white photographic paper with warm image tone, preferably suitable for portrait photography and retro-style work. Its contrast can be varied in a large extent from extra soft up to ultra hard by using colour filters at exposure. The paper is manufactured using a special silver chlorobromide emulsion that gives the silver image a brown-green to warm-brown tone that can further be influenced by the type of developer used. The paper base involved is colored in compliance with the tone of the developed silver. This accentuates rich scale of warm halftones ranging from light cream up to saturated brown-to-green black ones. The special silver chlorobromide emulsion of this paper makes it an excellent paper for lith processes.